Can't find this recipe in the book. Easy to make and so hearty, healthy and delicious. I needed to use up some baby back ribs so used those instead of beef and used Savoy cabbage instead of regular. Excellent. Fennel flavor is very good. Classic cube steak recipe. Easy and quick. The parsley butter is great. Perfectly fine, super easy preparation of acorn squash. These are my go-to pancakes. Simple and only five ingredients with no greasy metallic baking powder taste. However, they do come out quite thick, so it's worth adding a bit more buttermilk if you want a thinner batter. Made with Kate's buttermilk. Absolutely wonderful. Whole family enjoyed. Added an additional 1/4 cup buttermilk to get the correct consistency. The middle had a stodgy texture. The edges, which had browned a bit, were quite nice, but the recipe instructions do say it should not be browned. Fine, but because of the texture issue and uncertain instructions, I would try something else before repeating this. Revised! 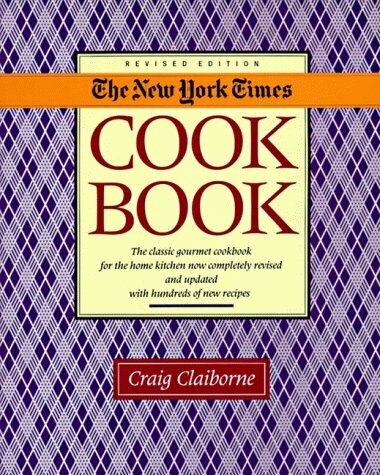 Since it was first published in 1961, The New York Times Cook Book, a standard work for gourmet home cooks, has sold nearly three million copies in all editions and continues to sell strongly each year. All the nearly fifteen hundred recipes in the book have been reviewed, revised, and updated, and approximately 40 percent have been replaced. Emphasizing the timeless nature of this collection, Craig Claiborne has included new recipes using fresh herbs and food processor techniques. He has also added more Chinese, Indian, and foreign recipes and more recipes for pasta, rice, and grains. Additional fish recipes, new salads and bread recipes, and an exceptional chili dish enhance this edition, which contains traditional American recipes and selected recipes from twenty countries. All the recipes are clearly presented and suitable for many different occasions, ranging from a wide variety of family meals to the most formal dinner party. The author also covers sauces and salad dressings, relishes, and preserves. And there are countless old favorites and those wonderful desserts. Complete with essential cross-referencing, a table of equivalents and conversions, and an index, the revised edition of The New York Times Cook Book is a superb new cookbook to give, to own, and to use for years to come.